Ann Taylor – Get 40% off your entire purchase in stores and online with code GOSPRING. Sale ends Monday 4/6 3AM ET. My favorite pieces this season include this floral flutter sleeve top and mini daisy flare dress. Banana Republic – Get 40% in your purchase in stores and online with code BRGOOD. Sale ends Monday 4/6 11:59PM ET. The new Ria scarf and moto jacket are spring ready pieces but I ended up just getting these (1, 2, 3) for my husband. J.Crew – 30% off your purchase of $200+ or 25% off your purchase of 100+ with code SPRINGSTYLE. Also, get free shipping on all online orders today. Sale ends Sunday 4/5 11:59PM ET. This cinched tank top is on my wishlist after seeing it on Style On Friday. J.Crew Factory – Get 50% off everything plus an extra 20% off clearance styles with code HOPTOIT. Sale ends Monday 4/6 11:59PM ET. I love this gingham button-down shirt and midi pleated skirt. LOFT – Updated 4/5: Get free shipping on any order + 50% off everything with code CYBER50. Ends Monday 4/6. New arrivals for spring are available often if you’re browsing the website including this scallop edge shell. The Limited – Get 40% full priced items online + an extra 20% off using code TREATME. Free shipping on orders over $100. This plaid cape trench, high waist grid skirt and epaulet cardigan are so perfect for spring. For this post I’m taking a break from LOFT and sharing some Ann Taylor try-ons that have been queuing up on my iPhone. Some of these photos I’ve saved since mid-February before I cut my hair (I’m looking forward to my much needed trim on Saturday). 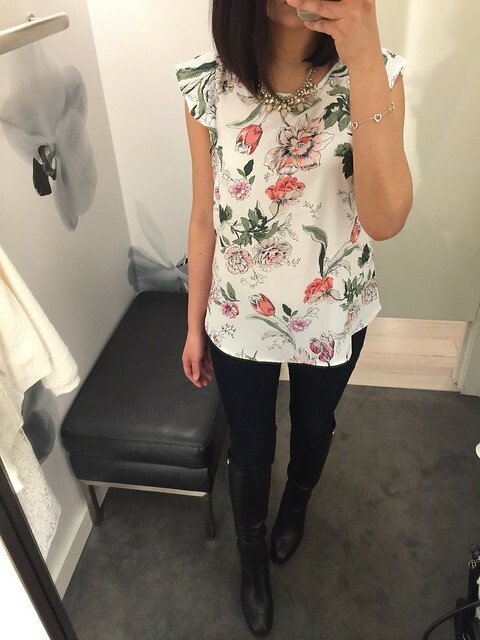 I fell in love with this floral flutter sleeve top the moment I laid eyes on it in store. 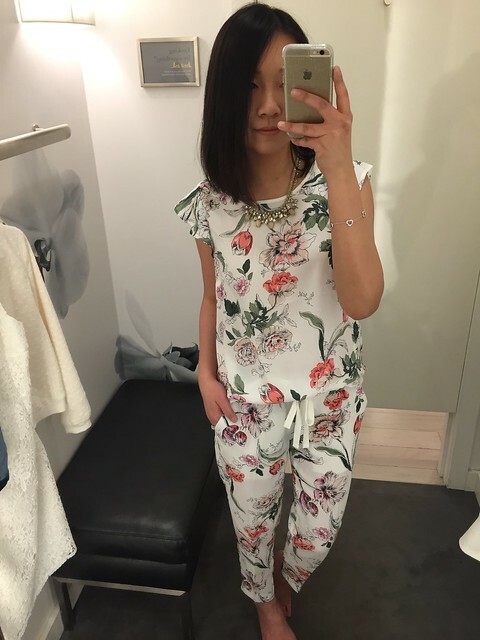 The floral print is seriously on point. I tried on size XS regular and it was a little loose and the arm holes a tad too big so I believe I need size XXS. Unfortunately XXS is an online only size and it’s currently sold out so now I’m contemplating petite XS, petite S. Decisions, decisions. 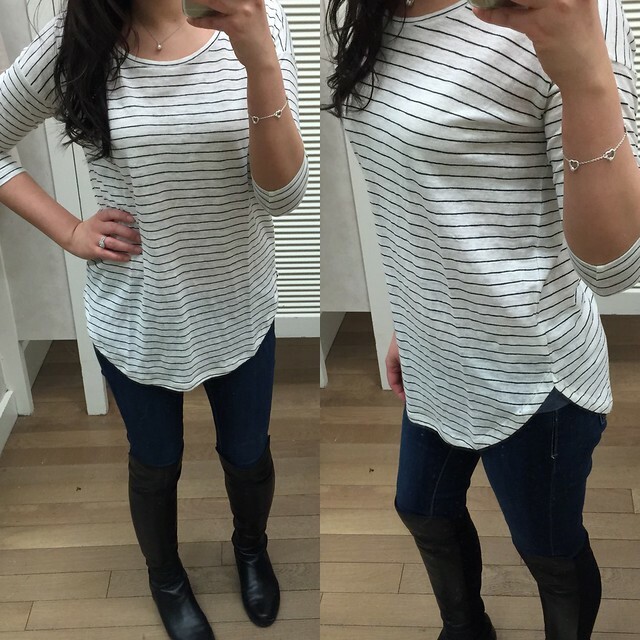 I’d say this top in size XS regular runs true to size for non-petite ladies. At this current price point I’m struggling to finding things that I “must have” to add up to the $175 minimum shipping so I still haven’t pulled the trigger. I don’t know if it’s just me but I feel like I’m getting less value for Ann Taylor versus LOFT prices. Also, after last month’s LOFT orders and a few in store purchases here and there I’m admittedly a bit shopped out and running out of room in my closet. I personally like to pay off my card in full every month but I have one return to do before my billing cycle ends (if it hasn’t already ended). It irks me when I pay more on my bill than I actually end up keeping even though I’m always giving Ann Inc. a portion of my paycheck. Ha. I tried on this pretty floral eyelet dress in size 0P and it fits really well but I think it makes me look kind of wide when viewed from the front so I begrudgingly passed. The eyelet floral print is gorgeous and I love the pleats along the skirt. For some reason I was expecting pockets in a dress of this style but there were sadly no pockets to be found. I like that the vneck wasn’t too low so it’s very modest and perfect for work or play. I’m not usually into the latest trends and always play it safe with neutrals but these floral drawstring ankle pants were so cute that I felt compelled to try them on. Size 00P fit me perfectly and I am tempted to order these but uncertain how much I’d personally reach for them. I’d say these pants run about one size bigger while the ankle length fits exactly as pictured in their stock image for someone my height. I was excited to try on this scalloped lace dress in size 0P after StylishPetite informed me that it was back this season. The dress hit a few inches above my knee and the v-neck is a little low for my taste but the floral lace is absolutely gorgeous and not too thick compared to previous seasons’ versions of the same style. I would say this fits dress fits true to size since size 00P fits StylishPetite. 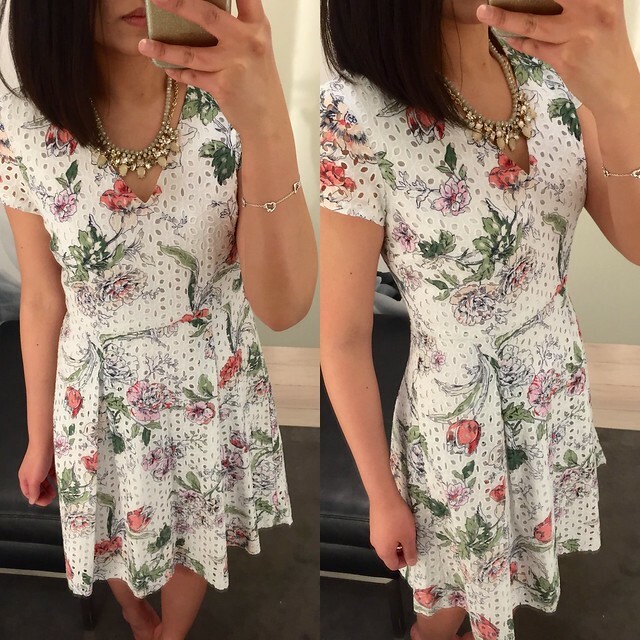 See my comparison of this dress versus the LOFT Floral Lace Dress (previous review) here. 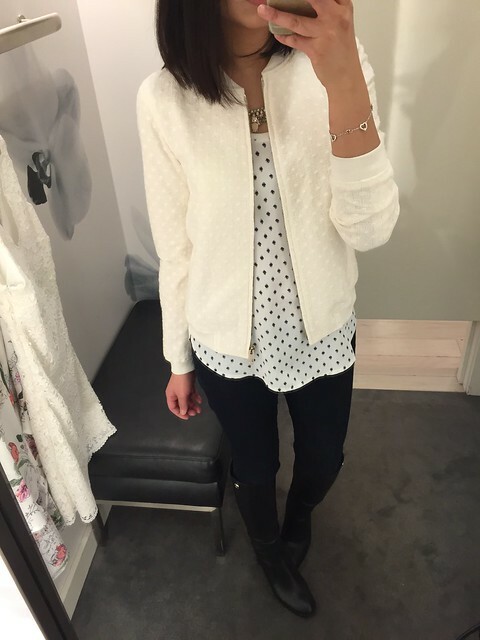 I spotted this cute embroidered dot bomber jacket in the racks and tried it on for size. Size XSP fit me perfectly everywhere but I’m looking for the perfect white/off-white blazer so my search continues. This jacket is really well made and I would recommend it to anyone looking for a cute bomber jacket that will pair well and tone down bright spring/summer outfits. See the solid/plain knit bomber jacket on Skirt The Rules. I actually tracked down and tried on this relaxed trench in stores as soon as I could after 9to5chic posted it online. 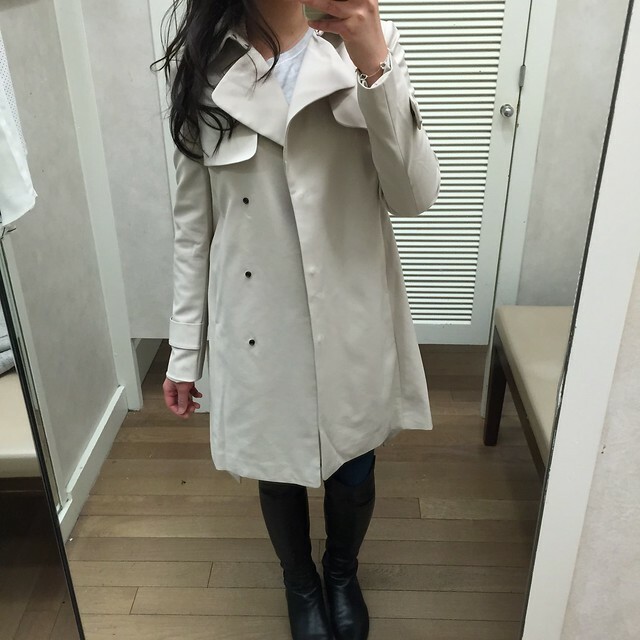 I was able to try it on in size XXSP which means this trench runs about one size bigger. I think it looked really bad on me belted because there was a lot of extra fabric on the sides and it looks like nothing special when unbelted. I also didn’t like the thin, wrinkle prone fabric and the sleeves were not finished properly as the one I tried one had a fallen hem (see sleeve on left – that is not the lining peeking through!). I’m sure the fallen hem could be remedied by ironing it in back place but I was expecting a more luxurious fabric that draped well as pictured on Anh. She’s tall and thin enough to make many things look effortless so I was sorely disappointed when this trench did not meet my fit and quality expectations. It did receive numerous positive online reviews so far so feel free to order way and then judge the quality and fit for yourself. I tried on this striped shirttail tee in size XS and it’s runs big so I would recommend sizing down. I prefer the heather cornflower color for spring and this may be a perfect striped top if you’re looking for a fresh replacement in black and white. One of the online reviews noted that this shirt washes well which I appreciate since partial linen fabric content always makes me nervous that an item will shrink in the wash. 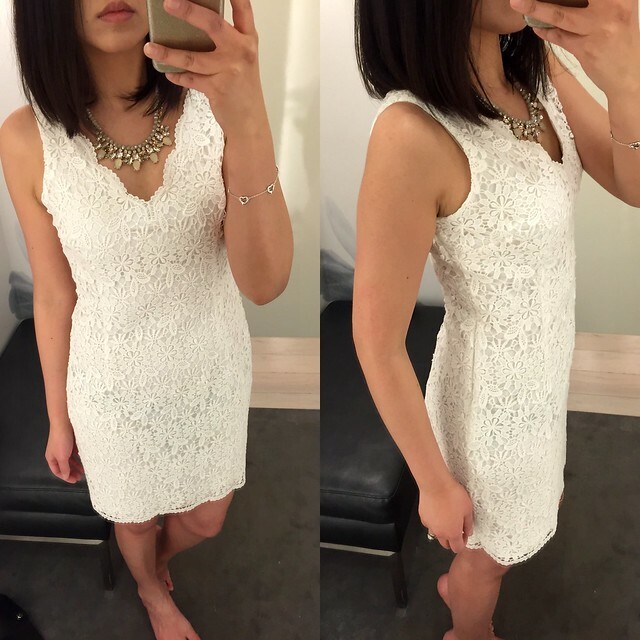 I tried on this floral lace sheath dress in size 00P the same time I bought my favorite mini daisy flare dress (review here). Apologies for the bad lighting but the lace detail is gorgeous in real life. I’d say that the dress runs one size larger and it will create curves where there are none on those with minimal curves like myself. Lastly, I also tried on this textured jacket in size 00P but it was way too boxy and big. 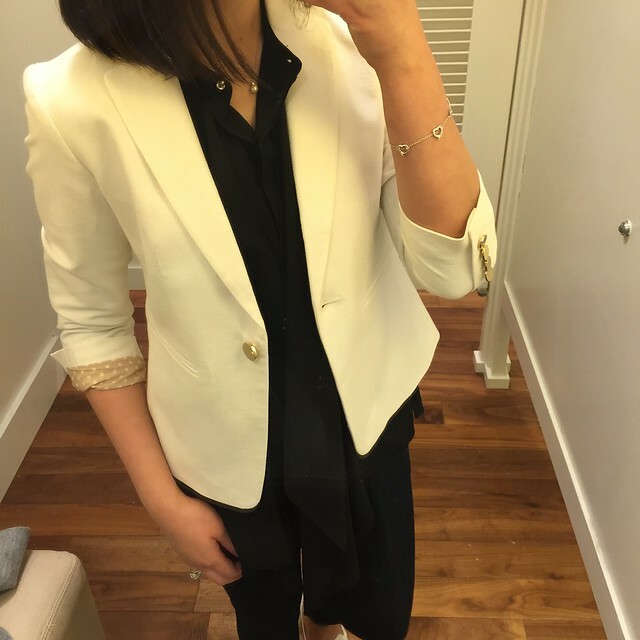 I would recommend sizing down in this blazer if you have minimal curves or a small bust. The cute polka dot lining when you cuff the sleeves is a nice detail since I don’t like the row of four solid gold buttons on the 3/4 sleeves.